DANVILLE, Va. - The Atlanta Braves today announced the 2018 coaching staffs for their minor league affiliates, with former Danville Braves player Barrett Kleinknecht assigned to manage the D-Braves during their 25th anniversary season. Kleinknecht spent the 2017 season, his first as a coach in the Braves organization, at the helm of a Gulf Coast League Braves team that posted a 31-28 record and finished second in the GCL Northeast. Kleinknecht, a resident of Florence, S.C., played for the D-Braves in 2010 after being drafted by the Braves in the 12th round of the 2010 MLB Draft. Kleinknecht's minor league career spanned six seasons from 2010 to 2015, with stops at each level of the Braves' farm system except the GCL. He played in 516 games and posted a career batting average of .239 with 37 home runs and 192 RBI. Kleinknecht retired after the conclusion of the 2016 minor league spring training season and spent the 2016 season working as a coach with the Braves' Single-A affiliate in Rome. Kleinknecht is the second former D-Braves player to later manage the team; Jonathan Schuerholz played in Danville in 2002 before skippering the team in 2012 and 2013. 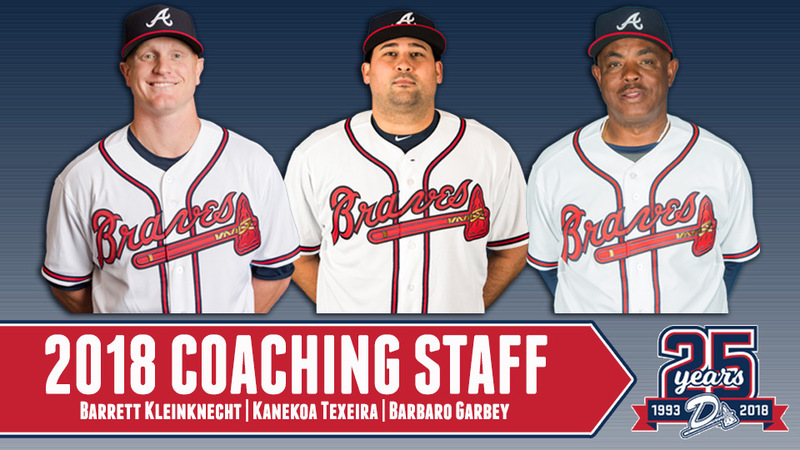 Two members of the 2017 D-Braves coaching staff will join Kleinknecht in Danville in 2018 - pitching coach Kanekoa Texeira and hitting coach Barbaro Garbey. Texeira and Garbey helped lead the Braves to a 36-32 record and third-place finish in the Appalachian League East in 2017. The 2018 season will be Texeira's second as a professional pitching coach, while Garbey will embark on his fifth season coaching in the Braves organization and second in a full-time role. Athletic trainer Drew Garner will join the D-Braves staff after spending 2017 with Kleinknecht in the Gulf Coast League. 2018 will mark Garner's second season in the Braves organization. He previously spent the 2016 season as an athletic training intern with the Chicago Cubs.